It was March, 1912. 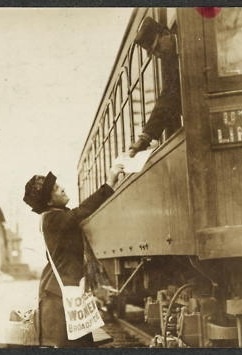 Emily Pierson and her sister suffragists were on a statewide tour of Connecticut, putting up posters, distributing handbills, speaking wherever they could find a space. Pierson’s brigade made one last stop at a factory before reaching Hartford. Inspired by the activists, one young woman worker decided to make her own statement. As she walked across the factory floor she paused at a dirty window and with her finger wrote “Votes for Women” in the grime. A male superintendent soon discovered the slogan and angrily wiped it off. The voting booth and the shop floor were two important arenas in the fight for women’s equality. Suffragists sought to change the U.S. Constitution, while women trade unionists demanded parity in the state’s factories and garment shops. 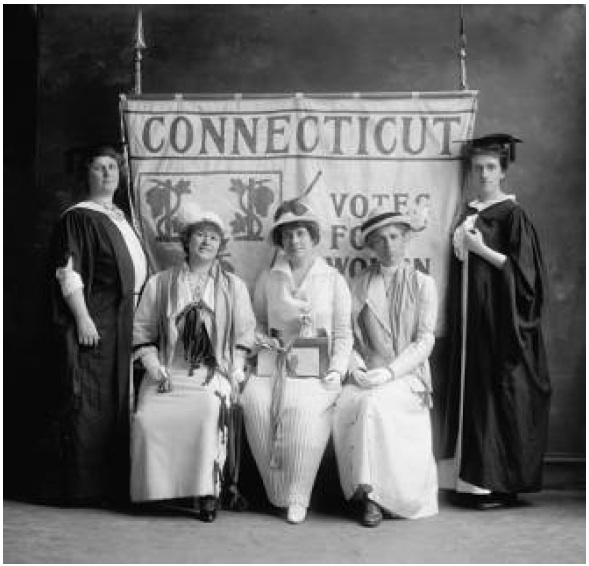 When these two movements intersected– in Hartford and around the country– both groups came closer to their common goal of women’s equality. Hartford suffragists also challenged the shameful practice of child labor. Three million U.S. children between the ages of 10 and 16 were wage earners in 1915. Disease and high injury rates were widespread in Connecticut mills; effective workplace safety laws and factory inspections were almost non-existent. The Equal Franchise League educated its members on the harsh reality of young factory and mill workers. The group agitated for a federal ban on child labor, pensions for mothers, and education reform. Local suffragists, who were largely middle and upper class, knew they had to win over working class women who would also benefit from the franchise. They consciously included working women in their activities. Hartford activists invited local sale girls and telephone operators to join their movement. “Only by having all women enfranchised on equal terms with men can the protection of women and girls be accomplished,” the League declared. Local activists were part of a national effort to lobby President Woodrow Wilson for his support of the 19th amendment. On May 2, 1914, when more than one thousand suffragists paraded through the streets of Hartford, the line of march included large numbers of working women, identified by their occupations. Conservative trade unions clung to the notion that they could maintain their relatively privileged status by ignoring all workers except those who were white, skilled, and male. But progressive unionists like those found in the Industrial Workers of the World (IWW, or Wobblies) understood the need not only to organize women but to make sure they took their rightful place as leaders and organizers. For the first two decades of the 20th century, famed agitators Elizabeth Gurley Flynn and Connecticut’s Matilda Rabinowitz organized both male and female factory workers for the Wobblies throughout the state. Male trade unionists also took up the cause of women’s political rights. Machinists’ union organizer Sam Lavit of Bridgeport had “done more for the National Women’s Party in Connecticut than any other man” declared a leading suffragist. But maybe the most telling moment in the effort to build a coalition between the women’s and union movements came at the 1916 convention of the Connecticut State Federation of Labor. Although its national body was on record in support of women’s suffrage, local labor leaders balked when a suffrage resolution reached the Hartford gathering. Abbie O’Connell, a Willimantic textile worker, joined Emily Pierson on the convention floor to plead their case. The women’s vote resolution was opposed by union cigar makers and saloon keepers, who considered the effort a job-killer because they equated suffrage with prohibition (another movement also largely led by women). Ironically, the few union women who were voting delegates also opposed the resolution, arguing that suffrage was a political question, not an economic one. “When we were asking the legislature for better working hours for women did we get help from the suffragists?” asked one hostile delegate. “Yes, I spoke for the measure,” Emily Pierson retorted. While the vote was being debated on this hot September day, brawny delegates cooled themselves with paper fans, inscribed with the words “Keep cool and raise a breeze for suffrage.” Despite parliamentary maneuvers to keep the resolution from being voted on, a heated discussion ensued. The motion passed, as did another to reduce hours of work for women. 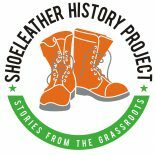 This entry was posted on May 10, 2013 by Steve Thornton in Hartford, Labor, Women and tagged connecticut, hartford, radical history, shoeleather history, womens history, womens suffrage.